Lenovo is known for building notebooks with exquisite keyboards, but the company is also no stranger to the tablet game. It has also introduced pioneering convertibles, such as the Yoga 11s and the newer Flex 14. The Miix 10 should be the culmination of that experience, but this hybrid falls short. The Miix 10's specs are par for the course--if you're playing last year's course. The 64GB of storage and 2GB of RAM are to be expected, but the Clover Trail-based Atom Z2760 at the heart of this device is a generation behind. Most of Lenovo's competitors have moved on to Bay Trail chips that deliver higher performance and longer battery life. During my testing, I encountered several frustrating slowdowns that didn't happen with the Bay Trail-based Asus Transformer Book T100, which uses a newer Atom Z3740 processor. And in our benchmark tests, the Miix 10 proved to be 10- to 20 percent slower than the Asus Transformer Book T100. The Miix 10 also delivered less battery life than the Asus hybrid: 8 hours and 22 minutes. While it sounds odd to call 8-plus hours "short," the Bay Trail-equipped Asus delivered more than 11 hours of useful life. The 1.28 pounds of curved edges and a flat back felt comfortable in my hands, but the 10-inch widescreen was a little too big for me to hold comfortably in just one hand even in portrait mode. Video resolution of 1366 by 768 pixels no longer sounds impressive, but I found it to more than adequate in my day-to-day usage, both on a desk and in my lap. The only time I noticed pixels was while reading in bed lying on my stomach, which put the screen about a foot away from my face. The bright display has excellent viewing angles, and it can be turned down enough for nighttime reading or movie watching without lighting up the whole room. The Miix 10 has all the ports you'd expect to find on a Windows tablet, including a Micro HDMI and a Micro SD slot (hidden beneath a plastic door) on the left side, and a headphone jack on the top right. There is also a Micro USB port, but it's in the center of the bottom edge, between the contacts for the keyboard dock. You can use it only if you're not docked to the keyboard, and you'll need the included adapter to plug in a full size USB device. Lenovo's keyboards, on the other hand, are straight-up awesome, even the chiclet ones. The Miix 10's keyboard cover is no exception. Lenovo has managed to make a 10-inch keyboard feel just as comfortable as my full sized laptop keyboard. Key size, spacing, and travel are all superb. The keyboard cover gives the tablet the feel of a high end notepad rather than a cheap netbook. It protects the back of the tablet in addition to covering the screen when closed. The tablet slots into a holder on the bottom and is held in by two clips on each top corner. I was worried that it would be hard to get the tablet out, but in practice it was very easy to go from desktop typing to couch surfing. 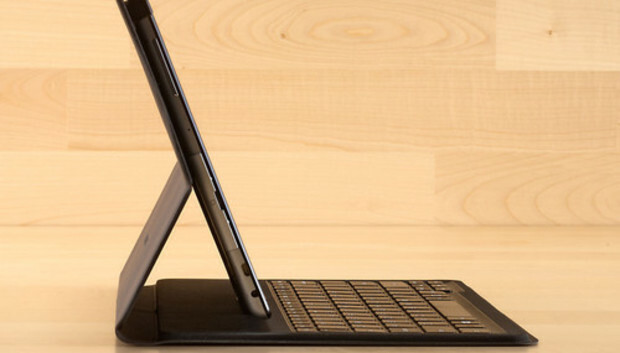 When opened, the tablet tilts forward and is held in place by a magnet behind the top row of keys. This proved to be surprisingly stable even when typing in my lap. This style does limit you to only one angle for the screen, but in all my location set ups, I found that one angle to work just fine. With the keys all the way at the front edge of the cover, there is no room for a trackpad. You might think that you don't need one because you have a touchscreen, except every time I touched the screen to reposition the cursor in a wall of text, the onscreen keyboard pops up. And if you need to use an old desktop program that's not finger friendly, you'll want to plug in a mouse--except the only USB port is now blocked by the keyboard. I'll admit a bit of bias as I'm such a fan of Lenovo's keyboards, but that's not enough to justify this price for a CPU that's a generation old. While not the best, performance and battery life are very good, so if your primary concern is a good typing experience, this machine might fit the bill.